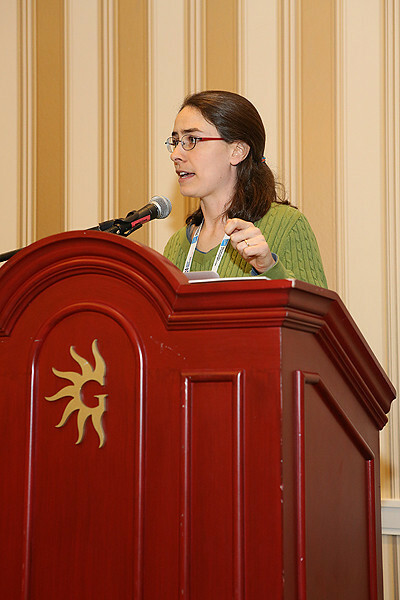 Meredith Hughes (Wesleyan University) of the AAS Committee on the Status of Women in Astronomy (CSWA) reviewed results from the committee's latest demographic survey of major astronomy departments and divisions. The survey has been tracking the representation of women across the field since 1992. Meredith Hughes (Wesleyan University) of the AAS Committee on the Status of Women in Astronomy (CSWA) reviewed results from the committee's latest demographic survey of major astronomy departments and divisions. The survey has been tracking the representation of women across the field since 1992. AAS photo © 2014 Joson Images.